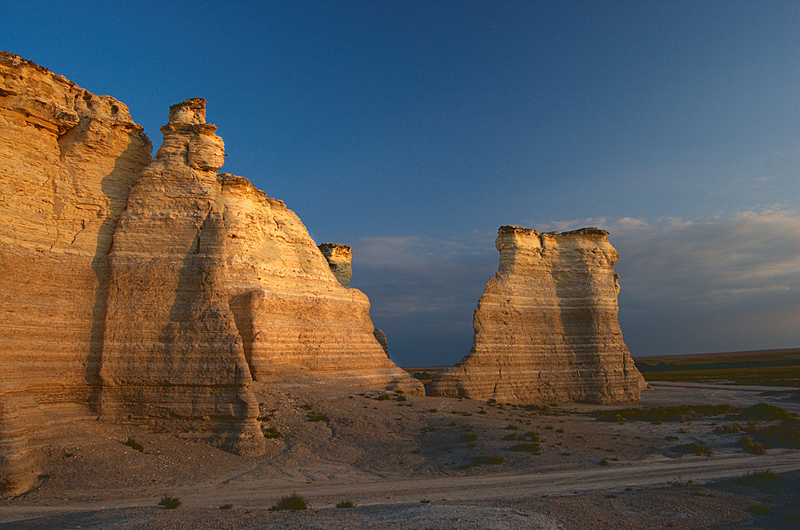 Just as the chalk pinnacles at Monument Rocks National Landmark in northwest Kansas do not fit the plains stereotype, water-management practices in Kansas belie its caricature as a state with regressive policies. Click image to enlarge. It’s easy to pick on Kansas. After the state’s Board of Education banned teaching evolution more than a decade ago — a decision that was overturned and reinstated several times — critics on the left feared that the move heralded a neo-medievalism rising in the nation’s Wheat Belt. Looking deeper at the state’s shifting social conservatism, the cultural critic Thomas Frank wrote What’s the Matter with Kansas?, a bestseller in 2004. Just two days ago, a Bloomberg editor caught whiff of a zany state House bill that would ban the state from using public money to dabble in the black art of “sustainable development.” The bill had little support, and no hearings were held to discuss it. I have not lived in Kansas. And I have not visited Kansas. But over the last year, I’ve spoken with Kansas farmers, state officials, academics, and water managers for several Circle of Blue stories on how agriculture is being affected by drought and how farmers are responding to long-term changes in the Ogallala Aquifer. All told, I am impressed with the state’s water policies. Yesterday, Circle of Blue published my story on how farmers in northwest Kansas will voluntarily regulate their own water use. The farmers decided that conservation matches their self and communal interests. Yes, you read that right: red-state farmers opted for regulations. Kansas has promoted forward-thinking water management policies ever since the state’s landmark 1945 water law that brought aquifers and rivers under the same regulatory system. Marios Sophocleous, who works with the Kansas Geological Survey, told me that the state has a tradition of good water-management practices, because it relies so heavily on the resource for irrigated agriculture, the backbone of many rural economies. The Kansas model combines state mandates with local control. Among its many water laws, Kansas has standards to keep a certain amount of water in streams, and the state requires all non-domestic water use to be reported each year. Groundwater withdrawals are monitored and permitted. A lot of water specialists credit current Governor Sam Brownback (R), elected in 2010, for reinvigorating the legislative process, which led to a package of groundwater-management reforms passed last year. Just as stick figures are a breeze compared to copying a van Eyck, mocking Kansas for what it seems to be is easier than understanding the state for what it truly is. I can’t claim anything near total knowledge and certain of its social policies are not progressive at all, but Kansas, at least for water, is much better than its caricature. The Stream, November 15: 'Waterless' Fracking?